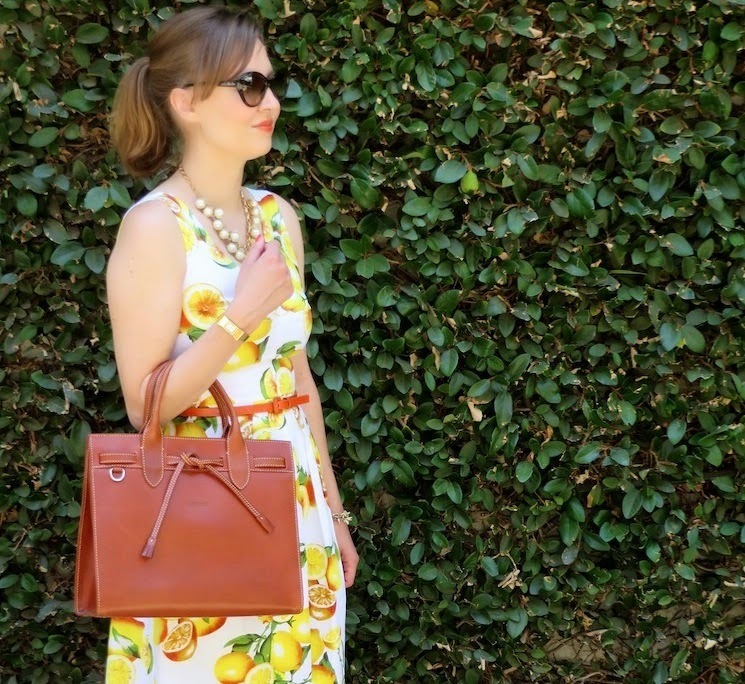 As a lover of all things citrus, I was on a hunt for a summery lemon dress for quite some time. My lust for lemon started with kate spade's Italia collection which featured a host of lemon themed items for spring. I was patiently waiting for the "lyric" (lemon) dress from kate spade to go on sale, but then on my way to the fitting room at Banana Republic I stumbled on this gorgeous dress. 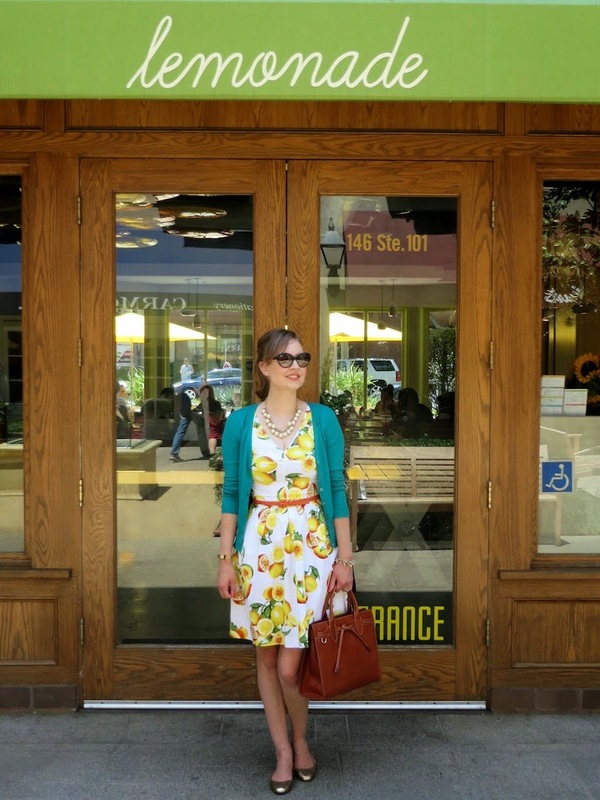 The Banana Republic Fit and Flare Lemon print dress was the perfect solution to my lemon dilemma. It was a fraction of the price and I actually liked the print which is more bold and colorful better than kate spade's subdued lemon print. Plus, who doesn't love a fit and flare style dress with pockets? This dress truly has everything a girl could want. Above I am standing next to a restaurant that is aptly named "Lemonade". 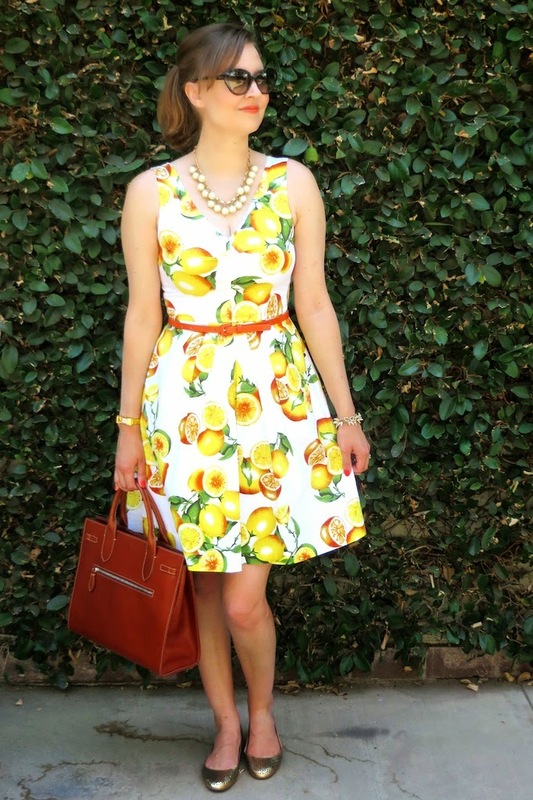 Where else could you possibly wear a dress covered in lemons? If you were wondering, this establishment sells pricey lemonade; it's not exactly your kid's lemonade stand on your block with 25 cent glasses of the refreshing lemon elixir. In between two matching UK phone booths. A bicycle store that just happens to have two giant yellow bicycle wheels on their store front window. A faintly yellow fountain. I'm just pretending I am in some piazza in Italy. Ciao! But what pairs better with a lemon dress than complimentary lemonade from Williams Sonoma? Free is definitely a price I like. Somehow it just makes the lemonade all the more refreshing and delicious. You and that lemon-y print = made for each other. That dress is perfect on you! Thank you Lisa! I think this is probably my new favorite dress :) I'm glad I was able to get it before it sold out.